but I have to say that Lombok island is the most beautiful and natural one. 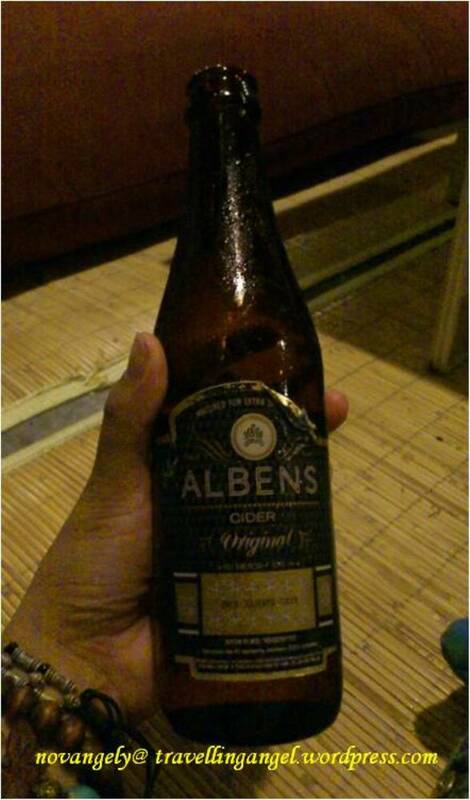 Woohoo.. 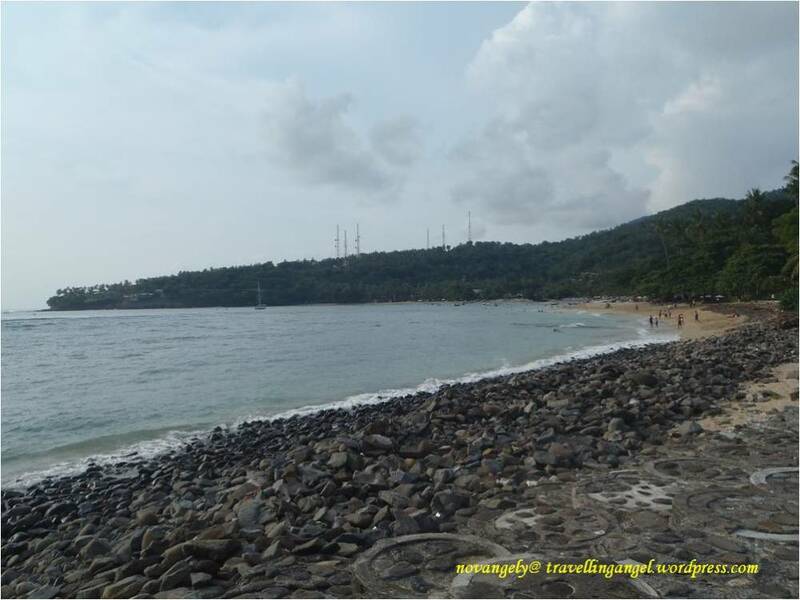 I finally visited Lombok island. I never thought this short trip would be a very nice and enjoyable one. 3 nites trip with 3 places to visit. Never crossed in my mind too that I would see so many amazing scenery. Lombok is a very beautiful island. I am so happy that I didn’t cancel this trip. I took an afternoon flight to Bali. It was crowded in the airport, both Jakarta and Bali, probably because of the long weekend/Easter holiday. I arrived in Bali airport around 10pm. I usually just walked to airport gate to catch a Blue Bird Taxi for 25-50% lower fare than airport taxi. But this time I was lucky! I met my long time no see best friend on the plane and she gave me a ride til my hotel in Kuta. I stayed in Tune Hotel Kuta this time. I want a place that is close from Legian clubs and affordable one. Tune Hotel Kuta has it all (if you booked in advance). 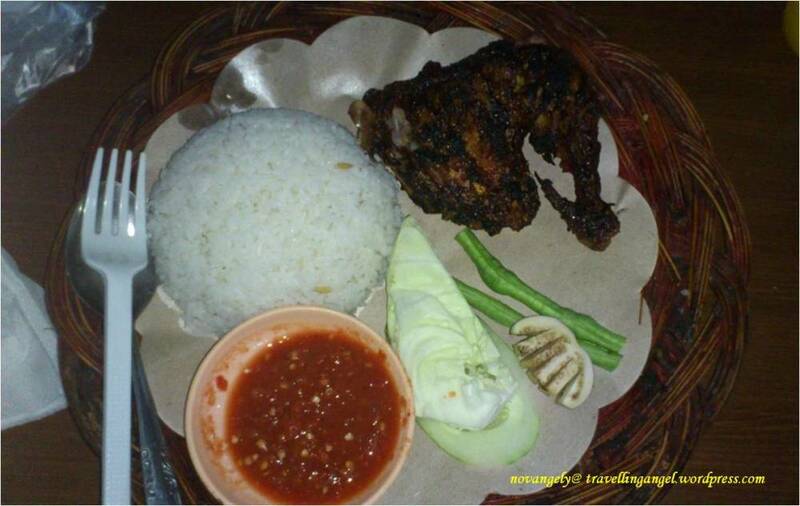 I got a promo price for Rp130,000/nite for fan room. When check in, their front officers greeted me very kindly. The room is small but it’s clean. It’s my first time staying there and I had a pretty good first impression. More about this hotel, please go to My Stay at Tune Hotel Kuta (bali) in my other blog. Hardly slept, I checked out from hotel early morning to catch the first flight to Lombok island and then going to Gili Trawangan island. I departed from the new domestic area of Ngurah Rai Airport . It’s still under construction, no tile on the floor but I can see that it’ll turn out to be a nice airport once it’s done. 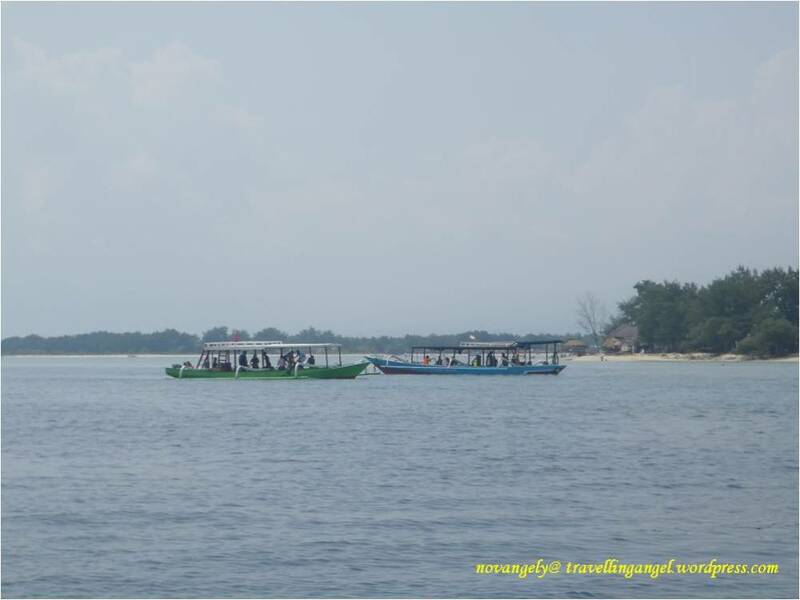 There are 2 ways to go to Gili Trawangan island from Bali, by airplane or by boat, and I took the plane. I chose it because I was worried with the sea condition and I had to be in Lombok as scheduled. It’s my first time taking short distance flight so I was surprise to see how small the aircraft is. I used Wings Air/Lion Air and it has 2-2 seating with only 20 rows, I guess. It was scary thinking that I was gonna be flying in that small aircraft but eventually the flight went well. It’s only a 30min flight anyway. 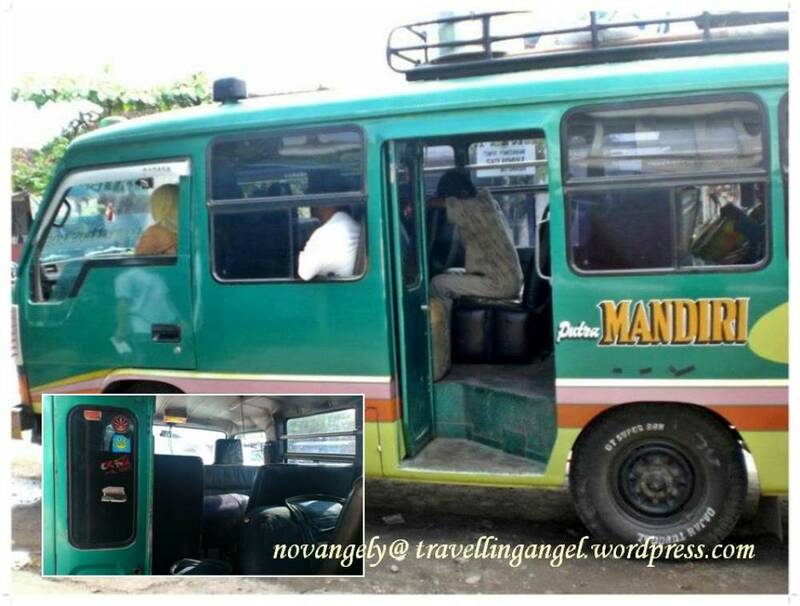 I was a bit confused that day, either to take airport bus to Senggigi (Rp.25,000) then catch a taxi (about Rp70,000) from there or taking a backpacker way. I somehow ended up taking the most cheapest option, the backpacker way. I took an airport bus called Damri. It is on your right side after exit gate. 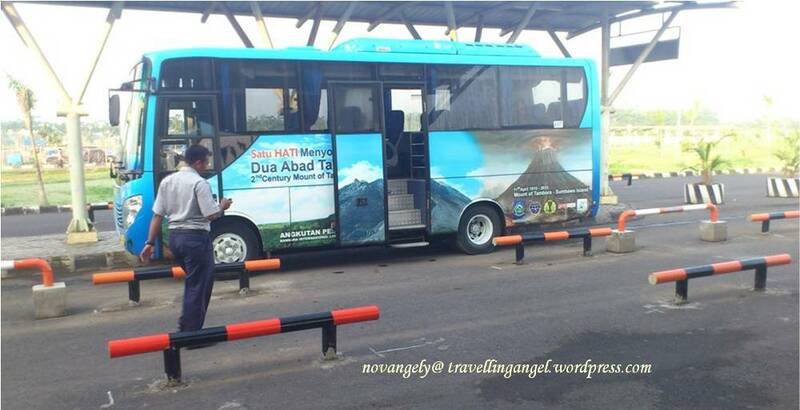 This bus will take you to two drop-points, in Mataram for Rp15,000 and in Senggigi for Rp25,000. 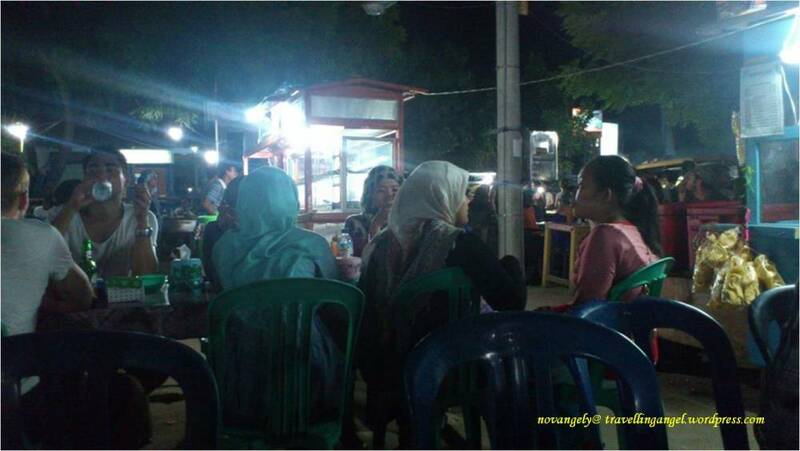 Their drop point in Mataram is like a small bus terminal. There are Blue Bird taxi waiting in the gate. I didn’t stop there but I asked the driver to drop me off at Lombok old Airport called Selaparang, within Mataram and Senggigi. I paid Rp25,000 for this (paid when buying the ticket in the counter for Senggigi destination). 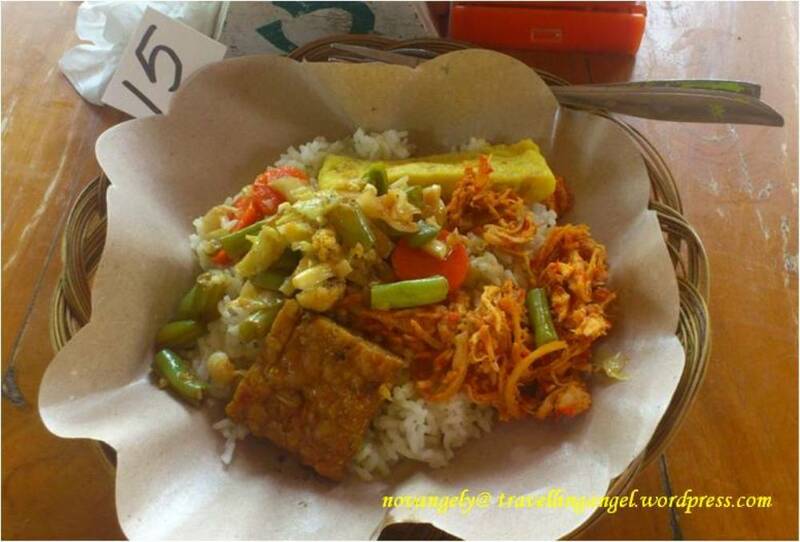 Then I took bike taxi or we called it “ojek” to Pasar Rembiga for Rp10,000. Pasar Rembiga is like a traditional market. 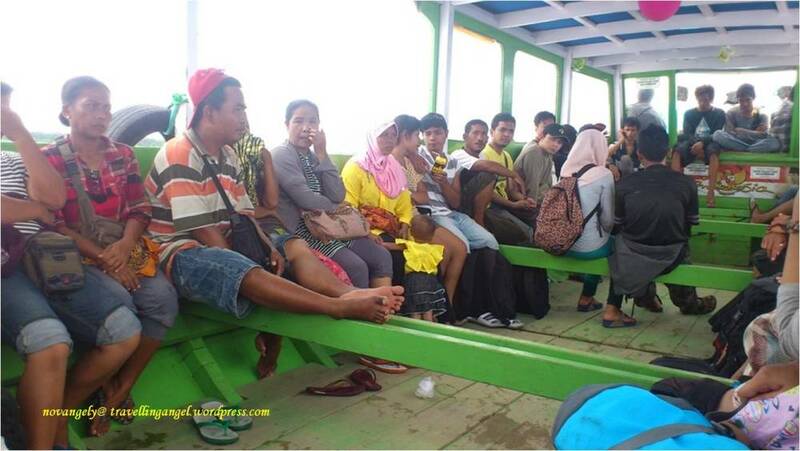 People usually catch a minivan bus called Engkel to Bangsal Pier from that market for about Rp10,000 . Fortunately, the bike taxi spotted that Engkel on the road and suggested me to take that green minivan. There were some passengers inside, some were smoking.. Ouh.. I hate when people smoking in public transportation, but we cannot complain, unless in Jakarta. The ride to Bangsal Pier took about an hour. You will feel like riding a roller coaster cause of the route passing mountainous area. It’s a fresh air for me seeing green everywhere. Despite that smoking passengers, I do enjoy the ride. 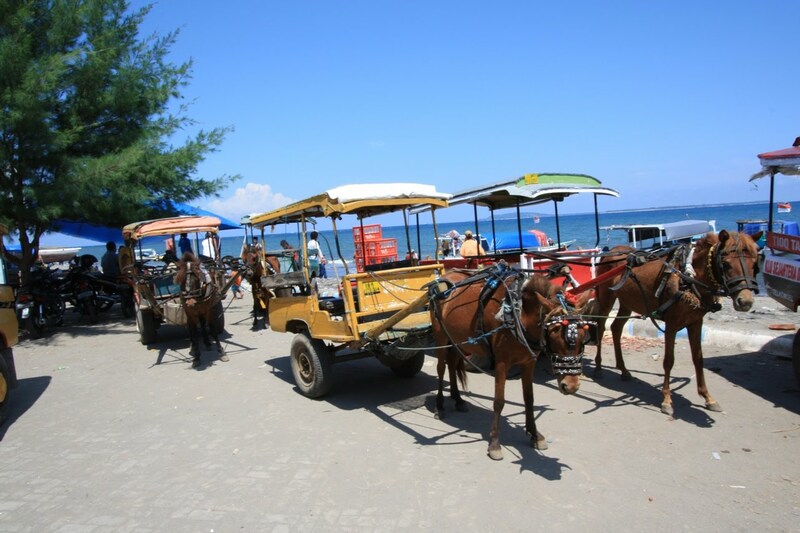 The ride to Gili Trawangan island takes about 20min. 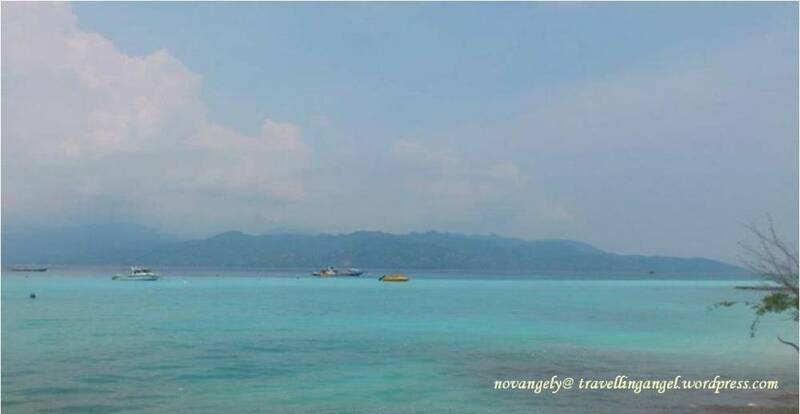 I can see the clear blue water and the 3 Gilis island from the boat. 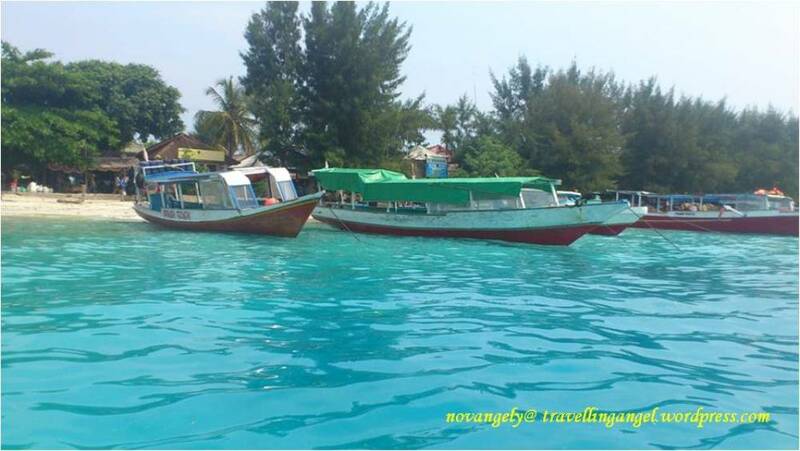 Gili Trawangan is the most touristic place among others with many budget accommodation, restaurants and nite entertainment. The island reminds me of Koh Phi Phi in Thailand without the hills or Pulau Kecil in Karimunjawa islands with population. 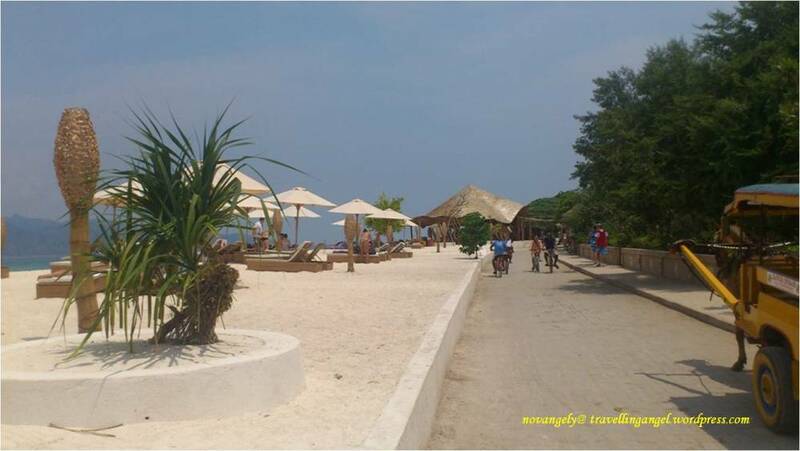 Soon after, I arrived in Gili Trawangan… I saw it has white sand.. The water is light blue-turquoise.. I felt like falling in love at the first sight. I luv it! Soon as you step on the main beach road, some touts will offer you accommodation . I, like usual, had booked my accommodation in advance. I chose to spend the nite in a dorm at Gili Hostel. This hostel is located about 5min walk from the pier. Just go right once you jump off the boat. It’s on the small alley next to Fortuna Café on your left. 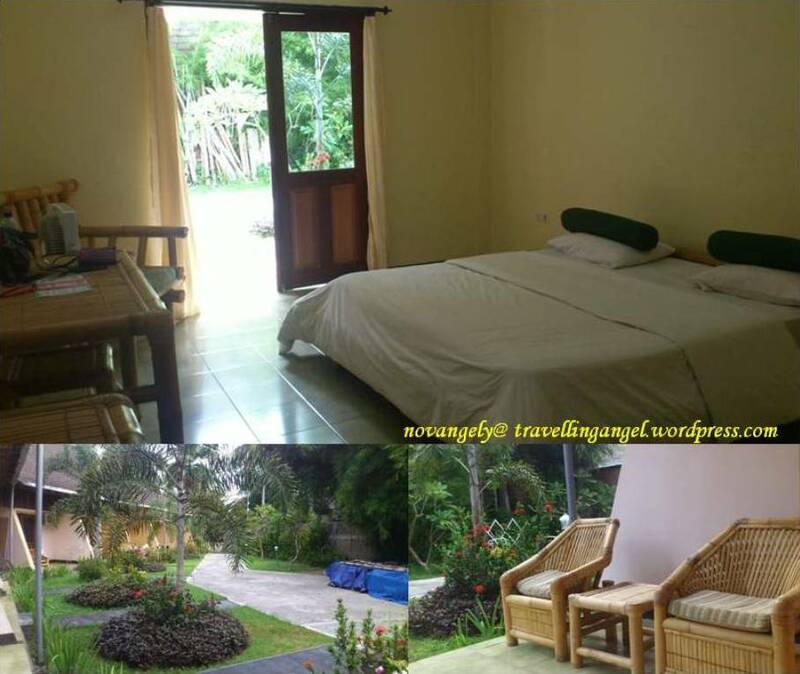 Gili Hostel offers a bed for about Rp.150,000/nite in a 7bed mixed-dormitory. There are more than 5 dormitories. 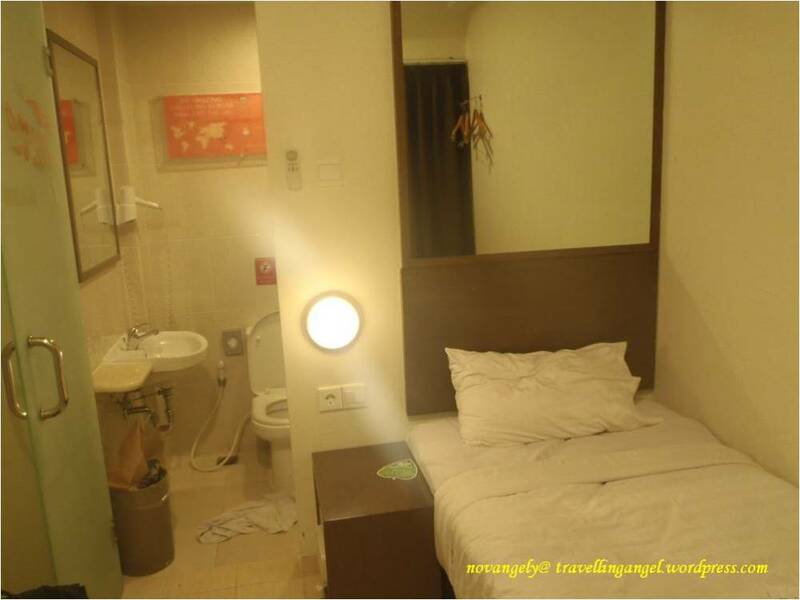 Each two dormitories has a connecting bathroom. The hostel has a Rooftop Bar which offers a very affordable drinks. It is a nice place to stay but unfortunately their bathroom cleanliness level is very low that I don’t think I would stay there again, unless they fix that. 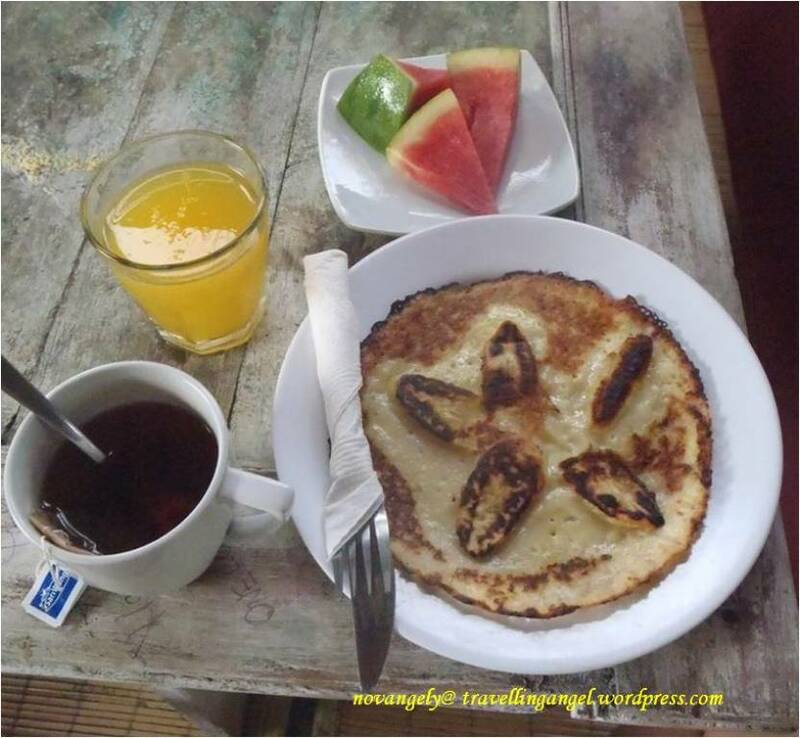 More about this hostel, please go to My Stay at Gili Hostel (gili trawangan) in my other blog. I didn’t really have plan that day. 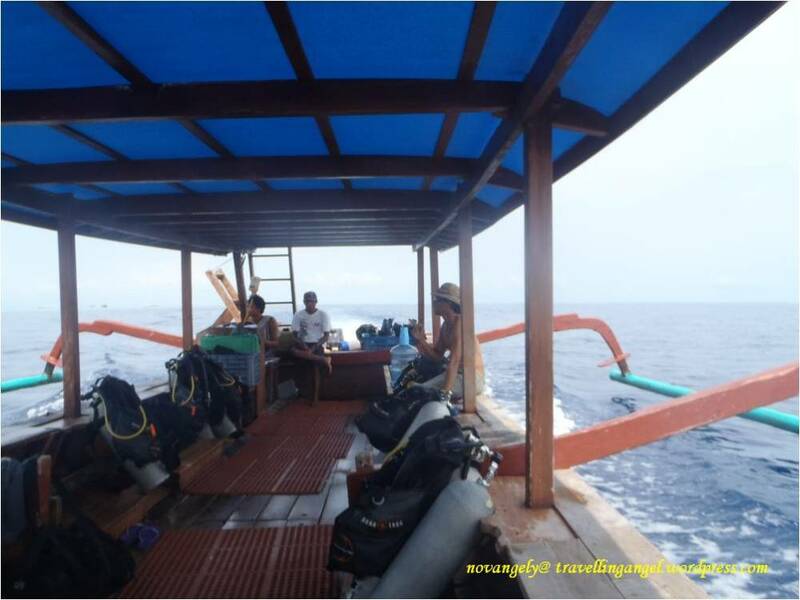 Just to check my diving schedule with Trawangan Dive for the next morning and to explore the island. So I took a nap in return to my sleepless night in Bali. After all energy came back, I went out again to get some food and photos and relax on the beach. I made a friend when having dinner in the nite market. She then took me around and showed me the island’s nite entertainment: Tir Na Nog, Irish Bar and Sama-sama Bar. We spent the time in Sama-sama bar. It is like beachfront café with reggae music which the late it gets the more beat the music has. 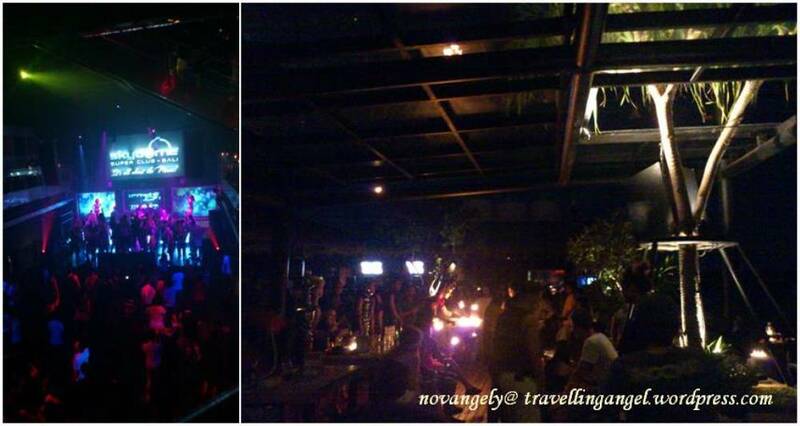 If I am not mistaken, there is only 1 bar that has a party in a nite and the party in Gili T is up to 5am. Cool!! I started my day with the hostel pancake breakfast. An orange juice, a fruit plate and tea coming along with it. Delicious!! 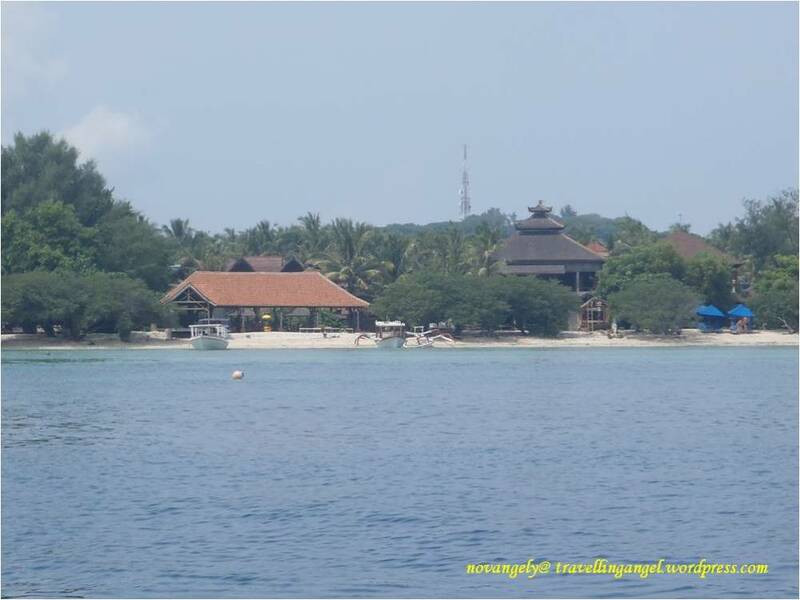 At 9.30am, I went to Trawangan Dive Center for a morning dive. My dive guide, Lis, is a friendly guy, so typical guide I used to have in Bali and he showed me amazing marine life. We dived in the site called Shark Point. I didn’t meet any shark though (thanks God!) and unfortunately the corals are mostly dead BUT I saw 2 giant turtles, Napoleon fish, nemos in their houses, Napoleon fish, Scorpion fish, giant Clamps, Tiger fish, Sting Ray, Bat fish and schools of about 30 Bumphead fish. I haven’t seen some of these fishes before. Awesome!! For better visualization, these are some pictures of marine life I saw when diving in Gili T but these are not taken in Gili T.
Below are the views from diving spot. Soon later, I found myself got in the boat to Bangsal pier. 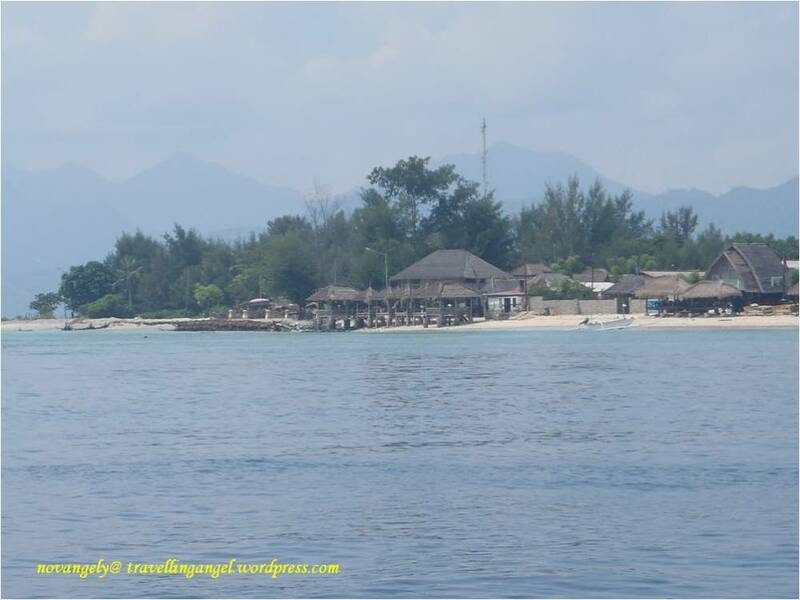 With the mixed up feeling, I looked at Gili Trawangan, trying to say goodbye and also wishing I could stay longer. I stayed in The Wira Guesthouse in Senggigi. My initial plan was to stay in their dormitory (Rp75,000) but then I decided to take their fan room without breakfast for only Rp150,000. The room is spacious with terrace and nice garden. The bathroom is unique with the shower floor covered with rocks. However later I found out that there were hundreds of ants on those rocks ><” I asked guesthouse staff to cleaned it asap and I didn’t see any more ant after. More about this guesthouse, please go to My Stay at The Wira Guesthouse (senggigi) in my other blog. 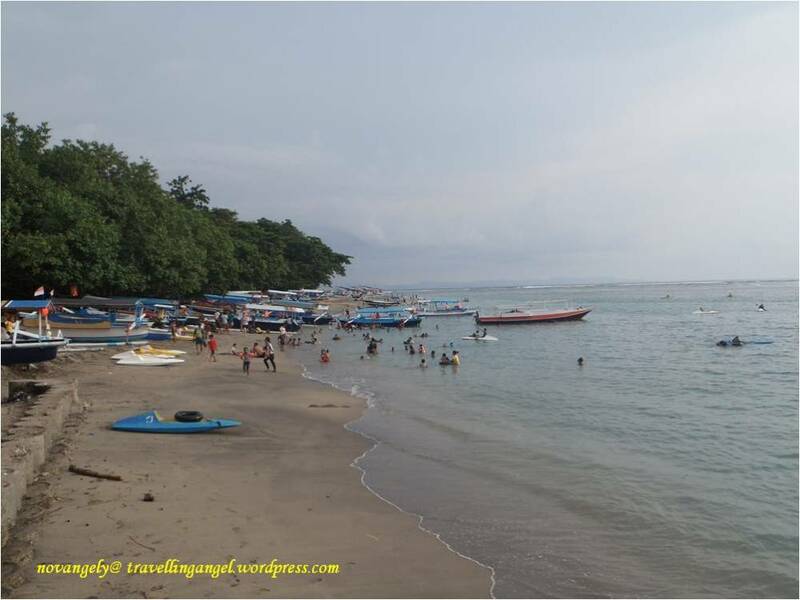 These are pictures of Senggigi beach near sunset time. There was still much time left after the sunset so I went to Orchid spa for a body massage. It is on the road from Senggigi beach to Senggigi main road and has the lowest price I can find (I did look at other places). I took the package for body massage with scrub and mask for Rp150,000/2 hours. Good bargain. 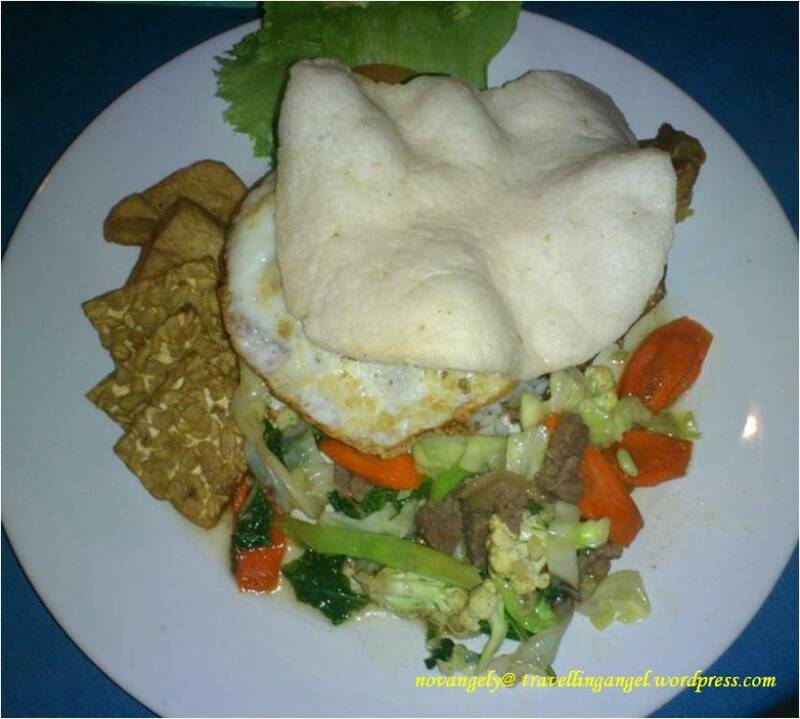 At nite, I spent my time in the guesthouse café, browsing, having dinner.. I was just too tired to explore other places. I only had 3hours sleep each nite on this trip. Tiring but it’s so worth it!! It’s my last day in Lombok. I don’t usually write it in my journal because it was just a short time trip. 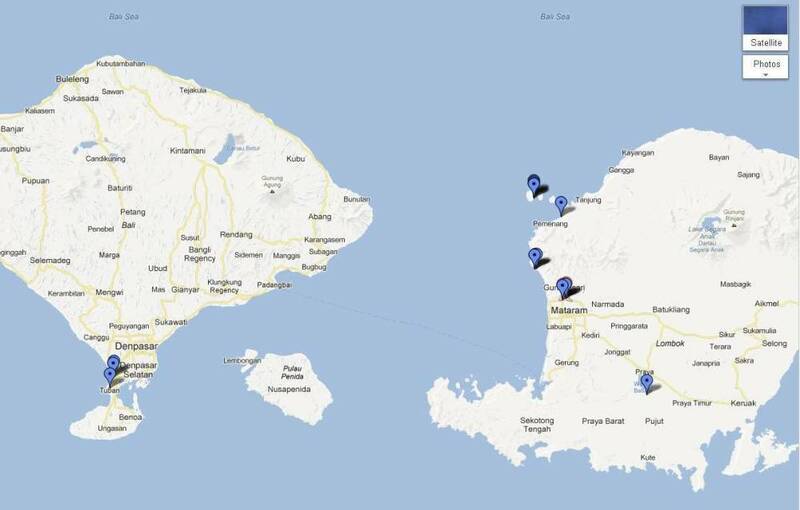 However, I want to share with other travelers about the journey from Senggigi to Lombok Airport at dawn. I took the first flight back to Jakarta. I went to airport by taxi bluebird group that I ordered in the afternoon. I asked them to pick me up at 3am and the taxi came on time. The driver is very friendly too. There is nothing bad with the taxi or driver as the usual Blue Bird group taxi service is. But what I want to share here is about the fact that going to Lombok Airport at dawn is quite scary. Why? Well, there is this fog, very thick fog that made us hard to see the road. We had that fog about 30min before we reached the airport. OMG!! I was so scared. I asked the driver to stop but honestly, there is like nothing around us so he just kept driving slowly. Thanks God we made it to airport safely. But we still had to wait for about 20min since the gate hadn’t been opened yet [:bummer:] It’s just weird and funny having had to experience it in an international airport. I also saw the first flight check in counter opened less than an hour before departure. I guess they are really newly built, really need some improvements. But despite all that happened, I am still willing to visit this beautiful Lombok island!! I can’t wait!!! 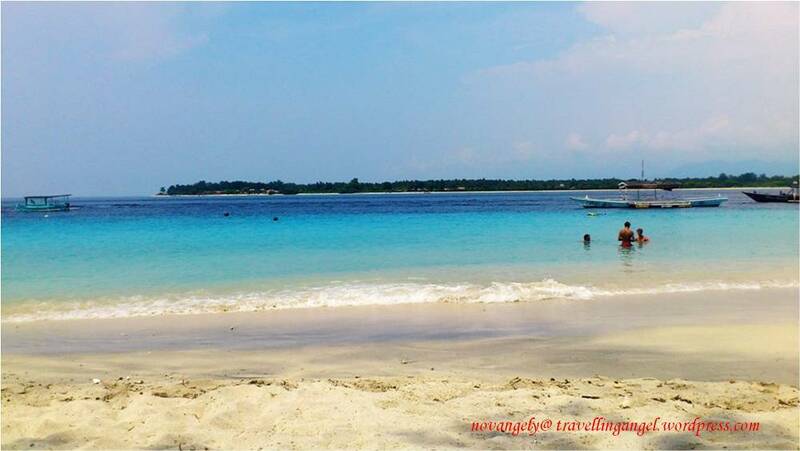 Gili Trawangan is so laid back and the water ow.. it’s so clear and so calm with that white sandy beach that I don’t hesitate to swim in it. 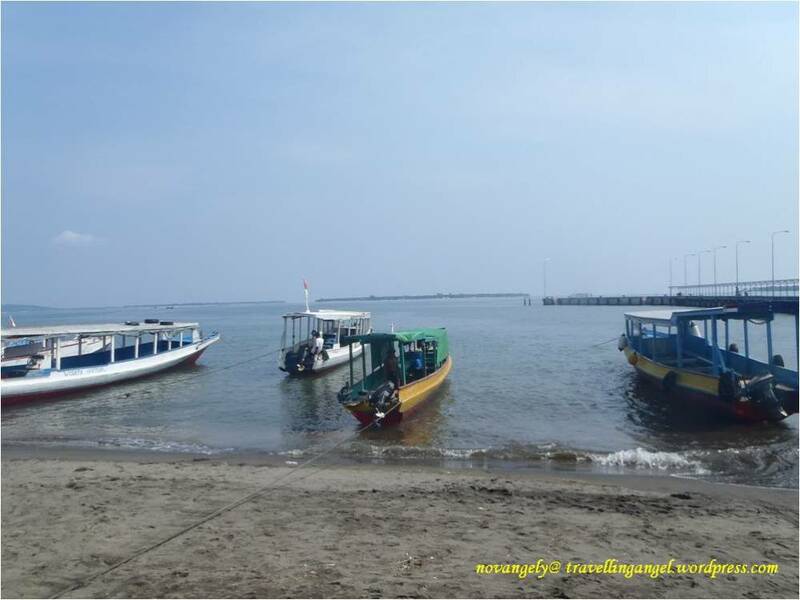 While Senggigi is a nice place for transit. It was quieter than Gili Trawangan. I would definitely go back there! !